The university student volunteers from the Church of God started the New Year 2017, taking a meaningful step for the protection of the environment. On January 15, the student volunteers carried out the ASEZ Green Campus cleanups at more than 80 campuses in 25 countries. ASEZ is an international group consisting of university student volunteers from the Church of God all around the world. It operates to help global villagers suffering from great and small problems such as global warming, and to plant hope and the love of God Elohim in them. 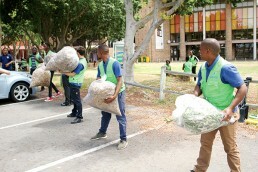 This day, the campus cleanups were aimed at protecting the global environment of campuses. Many students rolled up their sleeves at National University of Singapore, Humboldt University of Berlin in Germany, Paris Descartes University [Paris 5] in France, University of Washington in Seattle, U.S., University of Cape Town in South Africa, National University of Callao in Peru, University of the Philippines, National Autonomous University of Mexico, and so on. Despite a cold wave throughout Korea, the students cleaned up their surroundings by finding filth decaying under the fallen leaves as well as by picking up litter on the streets. They also removed illegal flyers that had taken over the walls and poles. 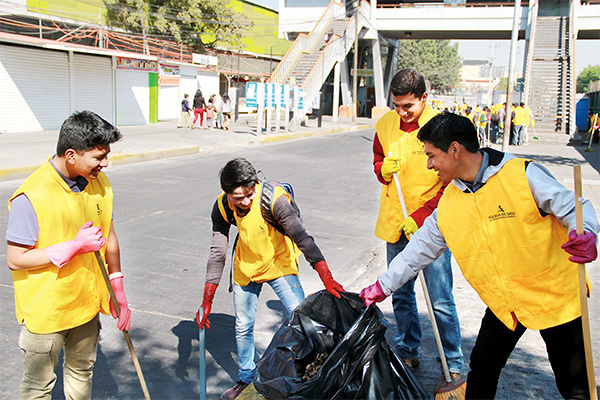 Wherever their hands reached, whether it was an open space at the campuses, the back of buildings, or crowded shopping areas around the campuses, it became clean and pleasant. The student volunteers are going to focus on U-SAVE [University Students SAVE the Earth] Movement; SAVE is an acronym for Social service, Awareness raising, Victim relief, and Environmental protection, which is the direction of their service for neighbors, communities, and the global environment. They will continue to carry out various volunteer services in connection with university students all over the world.